I knew there was a reason I had to be in England at the beginning of May - it's bluebell time! And even though I've been lucky enough to catch the snowdrops, daffodils and tulips on my brief trips home this year, it's the bluebells that I really love, so I've been out admiring them this week at gardens in Surrey and Sussex. First stop when I arrived from India earlier in the week was Ramster Garden, which I haven't visited before - and what a delight it is! 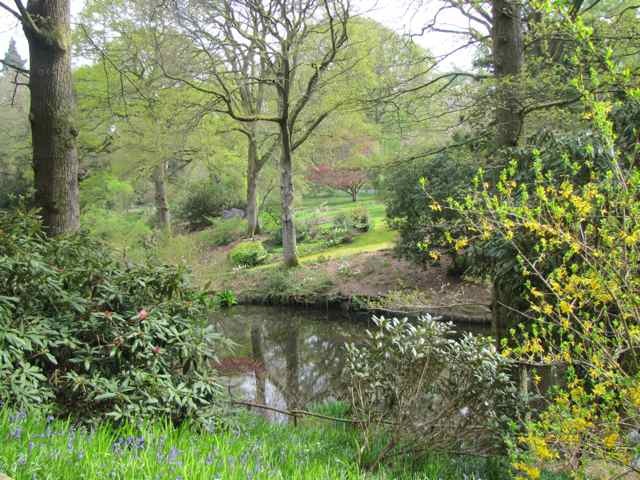 A wonderful woodland garden, filled to bursting with bobbing blue flowers! The season at Ramster is short - it's open for about 10 weeks - from early April until the third week in June - and Bluebell Week is the 9th-16th May, but with a Bank Holiday this weekend, English readers should head there soon to enjoy the wonderful bobbing blue heads because they're already in bloom! And it's such a lovely garden that you won't be disappointed. 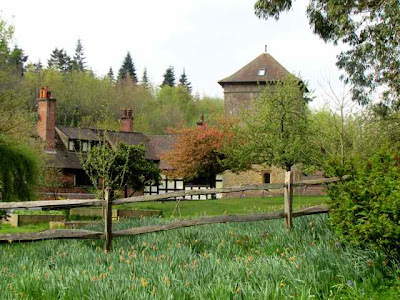 This is rural Britain at its best - Ramster is located just on the outskirts of Chiddingfold, once a major English glassmaking centre - and even I had forgotten how beautiful this part of England is. The gardens extend to some 20 acres and were laid out in 1890 by Sir Harry Waechter, but parts of the house (not open to the public) back to the early 17th century. And as you walk round the gardens you will catch glimpses of the property, which makes a wonderful backdrop to the rolling woodland gardens. Wander at your leisure here and you will see outstanding vistas at every turn. The camellias are already in full bloom and the azaleas and rhododendrons are not far behind, which means that May will bring a blaze of colour. But everywhere you look there's a different view, and you'll find many rare plants and shrubs here. This is a wonderfully peaceful garden and I can't believe that I've never visited before. And what's more, it's very close to one of my favourite gardens in the world - Vann - which is open this coming week - so you can combine the two! With a Bank Holiday on Monday, you can get to see both Ramster and Vann if the weather stays good, but do try and get to this part of Surrey, because Vann has very restricted opening times and both gardens are open this coming week. 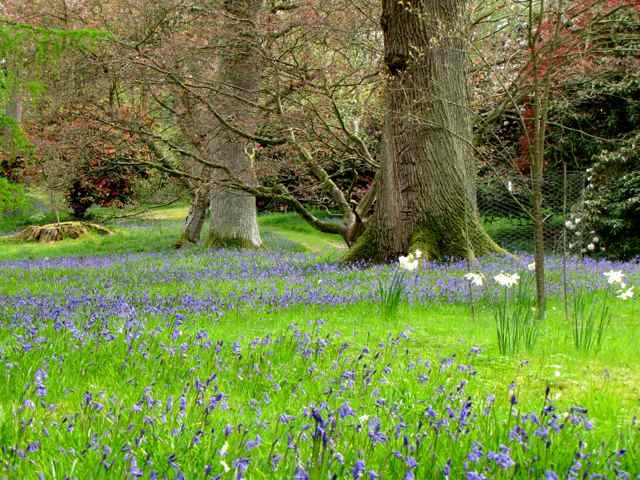 For a full list of gardens to see bluebells in the UK this month, click on this NGS link. What a stunning part of the country ... each of the photos shows just how beautiful rural England is. Every view is a picture postcard. That bluebells in the woodland is such a glorious sight ... but every photo shows a stunning view. Thanks for sharing this marvellous location. 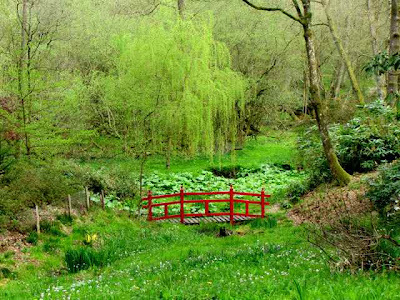 I so wish I could go there this Monday :-) It looks charming, the statues are fun and the little Monet like bridge. Have a wonderful weekend! Children at play is my favorite garden art subject.The drifts of bluebells beneath the massive trees is enchantment. Who am I kidding! Each and every photo is a wonderland. Visiting your blog is a blessing. Thanks. Oh, those bluebells make my heart ache! Bluebells are one of my most treasured childhood memories of a year spent living in England. I really hope I can make it back one May to see them again! Every time you post about a place, I think it's my new favourite place lol. Love the red bridge, and the photo with the sculptures! This is absolutely gorgeous - I really loved the photo with the bridge. Truly idyllic. Thank you! That made my morning seeing so many bluebells, I really do miss having them in the garden in springtime. The gardens and your photos of them are beyond amazing! I'm in awe. Oh, every picture of yours is just like a painting, so beuatiful! Forgot to mention last time that I love your new header picture, and I want to imagine myself walking on that path! 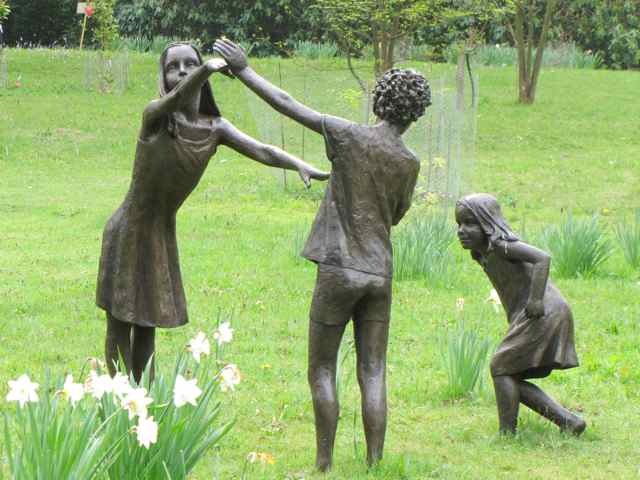 Such lovely english spring garden, and wish you enjoy as much as you can when you stay there. Oh you've made me homesick! I must make a note to see those gardens next time I go home to visit my parents, who live in Surrey. Thank you for sharing those beautiful photographs.